Holders Munster fell to their first defeat of the Heineken Cup campaign as fly-half Brock James bagged all 25 points for Clermont Auvergne. The Australian kicked six penalties and converted his 48th-minute try to secure a vital win for the French club. Munster, who lost at Clermont on their way to winning the cup last season, led 16-12 at half-time with Marcus Horan getting in for a try. But a powerful display after the break swung the contest in Clermont's favour. The French side had led 25-16 but an O'Gara penalty cut the gap to secure what could prove an important bonus point for the Irish province. The teams clash again on Saturday in Limerick in the fourth round of Pool One fixtures. Munster remain second in the pool, now one point beind Sale. With Clermont and Sale still to come to Thomond Park, Munster remain favourites to make the quarter-finals. However, they will feel they should have been top of the table having looked to be in control in the first half. O'Gara and James traded penalties to make the score 6-6 before Munster got the opening try in the 25th minute. Munster whipped the ball right and David Wallace's pass set up Horan to touch down in the right corner with O'Gara landing a fine conversion. The second half was a different story as Clermont pounded Munster straight after the break. A fifth penalty from James cut the deficit to a single point before he cut inside O'Gara to score Clermont's try. The conversion and another penalty maintained a 100% kicking record for James and put Clermont 25-16 ahead. O'Gara's penalty cut the gap but Munster's late surge failed to deny their French opponents the victory. 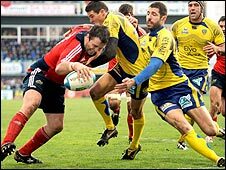 Clermont Auvergne: Floch, Rougerie, Baby, Bai, Malzieu, James, Mignoni, Domingo, Ledesma, Zirakashvili, Pierre, Jacquet, Cudmore, Lapandry, Bonnaire. Replacements: Emmanuelli for Domingo (72), Vermeulen for Cudmore (46), Audebert for Lapandry (68). Munster: Earls, Howlett, Murphy, Mafi, Dowling, O'Gara, O'Leary, Horan, Sheahan, Hayes, O'Callaghan, O'Connell, Quinlan, Ronan, Wallace. Replacements: Buckley for Horan (68), Fogarty for Sheahan (62), Ryan for Quinlan (52), Coughlan for Ronan (72).